How Do You Play Caribbean Stud Poker? - Casino Answers! Casino Answers » Caribbean Stud Poker » How Do You Play Caribbean Stud Poker? How Do You Play Caribbean Stud Poker? 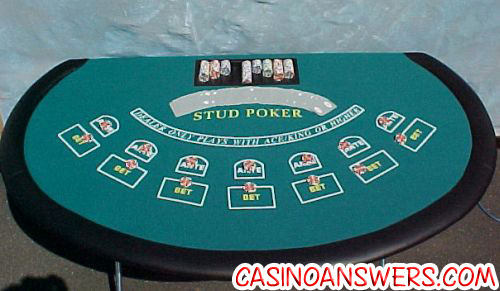 Caribbean Stud Poker is played with the standard fifty-two card Deck. Upon sitting down at a Caribbean Stud Poker table, where up to six people can play, you must place down one bet in the “ante wager” spot. Although it’s not necessary, you really really should be placing a bet in the Caribbean Stud Progressive Jackpot spot too. Once you have placed your bet, the dealer will then deal out five cards to all players face down, and five cards to himself face down. The last card dealt to all players and dealers is then turned face up. At this point you look at your hand, and decide whether you wish to play your hand, or whether you want to fold. If you fold then you lose your ante wager, as well as your progressive jackpot wager assuming you made that, and move onto the next hand. If you decide to play your hand, then you will put a bet of twice your ante wager in the betting circle. You turn over your hand and the dealer turns over his hand, and at this point a winner is declared. A winner is declared based on the standard poker hand rankings. First of all you must beat the dealer, however the dealers hand must also qualify with ace king minimum. If the dealer is qualified but you still beat him then you get both your wager and ante bet back. If he does not qualify you only get paid for your ante wager. And that’s how you play Caribbean Stud Poker. Check out our Caribbean Stud Poker Flash Game if you want to play Caribbean Stud Poker for free. Is there a Caribbean Stud Poker for Dummies Guide?